Pakistan is an agricultural nation, with 70% of the population living in rural areas and engaged in the agriculture and fisheries sectors. Sindh Province is very rich in aquatic resources and has a strong irrigation network based on the Indus River, canals, barrages, reservoirs, lakes, waterlogged areas and village ponds. Farmers, after facing immense agricultural problems, now are considering aquaculture as an alternate livelhood option. 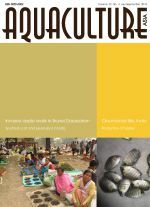 Many land owner-farmers, so-called agriculturists, are converting their properties for aquaculture production. Commercial pond-based carp culture has significantly expanded and is now widely practiced in Sindh. Carp farmers have been making good profits and achieving high yields, due to good practices. Freshwater/inland fish farming is regulated by the provincial fisheries department who supply seed, operate hatcheries, provide extension services and facilitate interest free loans, and collect primary data. 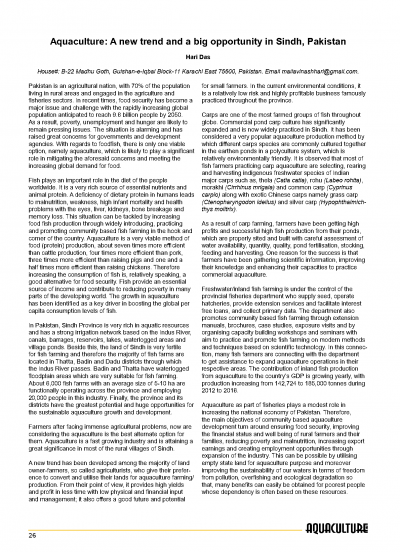 Although aquaculture presently plays a modest role in the national economy of Pakistan its future prospects are bright.